I’ll have more to say on this later, as the dust settles. © 2015 by David W. Tollen. All rights reserved. The articles posted here do not provide legal advice. No attorney-client relationship is formed by your use of this blog. You use the information provided here at your own risk. © 2017 by David W. Tollen. All rights reserved. 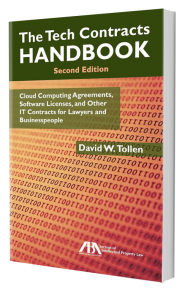 Draft, negotiate, and understand cloud computing agreements, software licenses, and more—through this plain-English reference manual and training guide.